The UN Assistance Mission in Afghanistan (UNAMA) today expressed its grave concern at the recent escalation of violence in Helmand province, which reportedly claimed the lives of at least 25 civilians, mostly women and children, and injured many more. On 9 and 10 February, international military forces conducted airstrikes in Helmand's Sangin District reportedly targeting anti-Government elements, according to a news release. UNAMA's initial enquiries suggest that the airstrikes killed at least 18 civilians, nearly all women and children. UNAMA notes that Resolute Support has initiated an investigation into the incident. On 11 February, Taliban conducted a suicide attack targeting Afghan National Army soldiers outside of Kabul Bank in Lashkar Gah, the capital of Helmand. The attack killed at least seven civilians, and at least as many were injured, mainly child vendors outside the bank, the release added. The people of Helmand have suffered greatly due to the armed conflict in Afghanistan, with 891 civilians killed or injured during 2016. This figure was the highest in the country in 2016 outside of Kabul. UNAMA reiterated the need for all parties to the conflict to strictly adhere to their obligations under international humanitarian law to take all feasible measures to protect civilians from harm while expressing its sincere condolences to the families of victims and hopes for a speedy recovery to those injured. 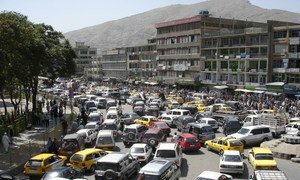 Afghanistan has been in protracted conflict for some 35 years, which has seen an ever-growing number of civilians killed and poverty reduction and development efforts seriously hampered. UNAMA is mandated to support the Afghan Government and the people of Afghanistan as a political mission that provides 'good offices' among other measures. 'Good offices' are diplomatic steps UN takes publicly and in private, drawing on its independence, impartiality and integrity, to prevent international disputes from arising, escalating or spreading. UNAMA also promotes coherent development support by the international community; assists the process of peace and reconciliation; monitors and promotes human rights and the protection of civilians in armed conflict; promotes good governance; and encourages regional cooperation. The United Nations condemned today’s suicide attack outside the Supreme Court complex in the Afghan capital, Kabul, and stressed that those behind the deadly bombing must be held to account.